Thanksgiving Feast - Roast Brunch! Roast Turkey with special comfort food favorites like pumpkin pie, cranberry stuffing and corn bread....vegetarian crispy fried chicken for those who don't eat meat with tons of trimmings too. Your choice of either Roast Turkey or Vegetarian Crispy Fried Chicken with cranberry stuffing, sweet potato mash, corn on the cob, sautéed green beans, corn bread, roast potatoes, sausage & bacon casserole or veggie sausage & veggie bacon casserole with carrots & mushrooms, tons of gravy, pumpkin pie and candied fruit slice. Please book before Wednesday 26th to guarantee your place at the feast! 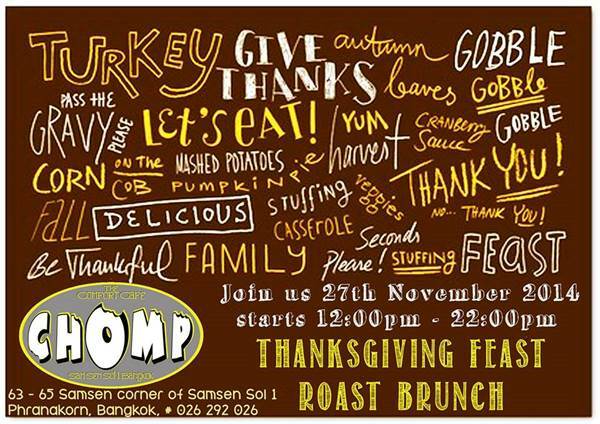 550THB per person including a special festive hot Spiced Apple & Pomegranate Cider and a Pumpkin Pie Martini !! !